My case for meal prep: I love the idea of not having to think about what I am going to eat for the next few days. I love that I get to include whatever veggies I want and feel healthy about my meal choices. And also, not spend that much on food – though that’s not always the case because ingredients are not always that cheap. The best thing about this recipe is that it can both be used for meal prep OR to feed an army (of 4 people). :p On the downside, compared to my other meal preps which have a wider variety of ingredients and healthier carbs, I’m not sure if I will tire of this pesto pasta by day 4 or the food coma I’ll get from the carbs will hit me harder. Heh, we’ll see. Also, even though this is organic, it’s slightly cheaper and a whole lot less effort than making your own pesto. And my plebeian tastebuds can’t really tell the difference between home made or bottled pesto. Correction: Can’t tell the difference between pesto I’ve made and bottled pesto. HAHA. Also, the recipe stated 1/4 cup of pesto but I put the whole bottle in. I mean like every time I buy pesto, it feels like the ENTIRE bottle is needed to coat them pasta. Pesto chicken or PRESTO! chicken? It kinda looks like green curry but it’s pesto and heavy cream combined. Oops, I realised I should have put in more cream. I thought the recipe said 1/4 cup but it was actually 1 cup. HEH. Guess my pasta will be healthier! Prep onions, garlic, broccoli and meat. Place on plate. Pour oil into a large pan. Add the diced onion and cook for 3-4 minute or until golden. Add the garlic and cook for just a few seconds then add the sliced chicken. Season with salt & pepper and cook the chicken for 5-7 minute or until browned. Once your water is boiling, cook the pasta in a large pot according to package directions. Add the broccoli into the pasta pot 1 minute before turning off the heat. 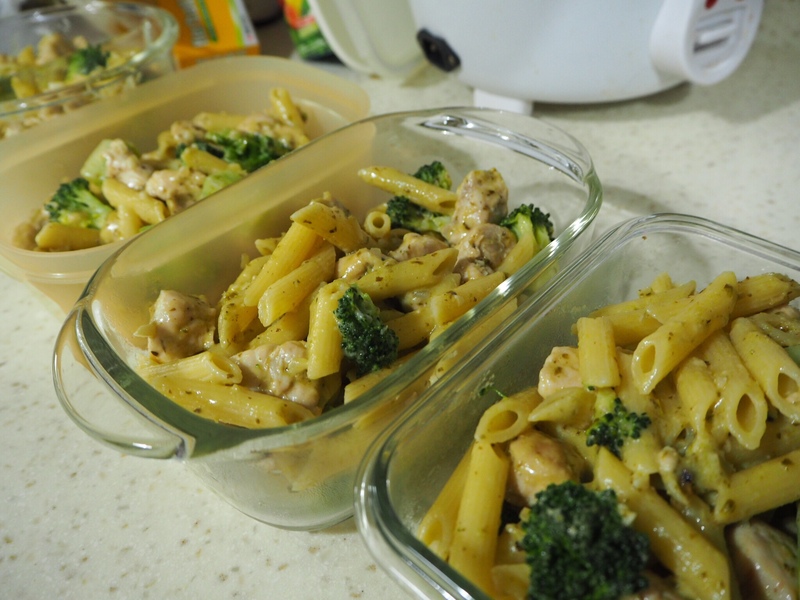 While the pasta is cooking, add the parmesan, cream, pesto, and salt & pepper to the pan with the chicken. Simmer mixture for 2-3 minutes. Add the cooked pasta and broccoli. Stir until fully combined. Simmer for another 2-3 minutes. Remove from heat and garnish with more parmesan. Enjoy! Not very economical at $7.28 (Offer price: $6.60) per portion! But I used 2x$5 AIA vitality vouchers* so it works out to $4.10 (after discounts and vouchers) per portion. * I signed up for the AIA vitality challenge where you get points from clocking steps and exercising. If you AND your team of 8 hit the weekly target, you get $5 (for your own target) and $5 for your team’s target. It has been great, using my vouchers for ingredients I would not have thought to try if not for the $10 off. HAHA. Anyway, thank you Gimmedelicious for the recipe!